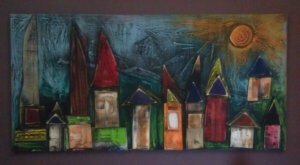 Chattanooga Real Estate Update: Outfitting Your Home with Local Art! Outfitting Your Home with Local Art! As you look at homes throughout Chattanooga to find the perfect purchase, or visit those of your new neighbors, you will probably run across many pieces by local artist Daniel Johnson (the images in this post are all Johnson works, as seen in local homes). He has been a prolific presence in the Chattanooga art scene for years, though lately it seems that more and more people are catching on to his unique multimedia works. Cityscapes painted on layered wood, old doors carved with nature imagery and washing machine panels painted and ground to create soft, powdery dream-like images are all part of his inventive repertoire. His work has appeared in homes throughout downtown and historic Chattanooga, in neighborhoods like St. Elmo and Highland Park where Johnson's skyline paintings look similar to the surrounding area. There seems to be a symbiosis between the city and Johnson's imagery -- Chattanooga bleeds into his work even as its residents decorate their homes with the artist's familiar images. Because of the rugged materials he uses, Johnson's creations can be displayed with more versatility than the average oil or acrylic painting on canvas. They have been hung on front porches or incorporated into the architecture of buildings. A local software and tech startup, Woople, has outfitted their new office at the corner of Tremont and Frazier with some of Johnson's doors, set into the walls as if they might lead to some more imaginative place. Johnson's art has also been a fixture at mainstay local galleries including Winderbinder Folk Art and Area 61. Daniel Johnson has had success in larger art scenes as well, selling pieces to galleries in New York and Atlanta, and visitors from all over the United States. When his work goes on to other cities, it brings with it some of the flavor and culture of Chattanooga. Should you be considering outfitting your new home with fine art, look no further than your local artists and galleries. Chattanooga has an impressive art scene for any city, and especially one of this size. As you decorate your home, consider art scene events like Winderbinder's Art Til Dark and Faux Bridges Fest or Main Street's Southside Art Stroll monthly gallery hop event. From places with upscale handicrafts like Plum Nelly to the HART Gallery, which features work by the homeless and individuals with disabilities, Chattanooga has art for every budget and aesthetic. Considering bringing a little of Chattanooga into your home as you make it your own!